MXGP SET FOR THE EUROPEAN START. It is time for the 2nd round of the 2018 FIM Motocross World Championship, the MXGP of Europe. After the epic season opening race in Patagonia Argentina the MXGP and MX2 riders are ready to take on the first European stop of the season. For several contenders this will be there first race as both MXGP and MX2 have 40 riders entered. 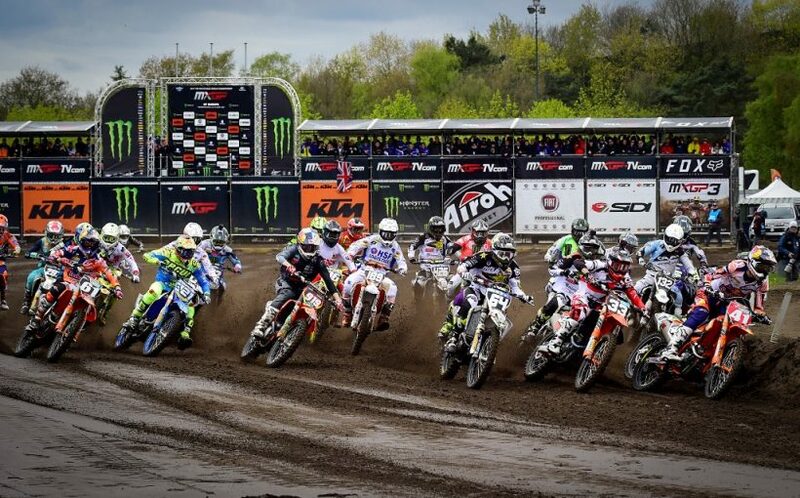 The dark sand of Valkenswaard will also host the first round of the European Motocross Championship’s EMX125 Presented by FMF Racing and EMX300 Presented by FMF Racing. The EMX classes have a massive number of entries this weekend, to be exact 90 in EMX125 Presented by FMF Racing and 50 in EMX300 Presented by FMF Racing. There are many new names to both classes but also be sure to watch out for the returning faces such as Brad Anderson or Mike Kras in 300cc. Red Bull KTM Factory Racing’s Jeffrey Herlings and Pauls Jonass will go to Valkenswaard with the first GP victory in the pocket. While Red Bull KTM Factory Racing’s Antonio Cairoli, who is tied for the lead in the MXGP point standings, among other top contenders well look to take the overall win. Red Bull KTM Factory Racing’s Jeffrey Herlings comes to Valkenswaard on the heels of an epic comeback and last lap pass for the win at the opening round of 2018. Herlings has been extremely successful on the Valkenswaard circuit in the past and the track is not only his home GP but sand as well making him a force to reckon with this weekend. Red Bull KTM Factory Racing’s Antonio Cairoli is tied in the points standings after swapping wins with Herlings last time out. With the 9-time champ losing out on the overall in Patagonia he is without doubt looking to beat Herlings at home. Cairoli has claimed the GP overall in Valkenswaard an impressive 6 times and 5 of those have been in the premier MXGP class. While it has been now 3 years since the Italian saw the top step here, perhaps this weekend could be his turn once again. Monster Energy Kawasaki Racing Team’s Clement Desalle has never won in Valkenswaard but showed great speed with his 3rd overall to start the season. The Belgian is joined by fellow countryman, Julien Lieber, under the factory Kawasaki awning. Lieber rode to an impressive top ten in his MXGP debut and is certainly a rookie to watch. Rockstar Energy Husqvarna Factory Racing’s Gautier Paulin was under the weather the week of the first GP but still managed to place in the top ten. A healthy Paulin will be hard to deal with seeing he won the MXGP of Europe at Valkenswaard last year. 2016 Valkenswaard winner, Team Monster Energy Yamaha’s Romain Febvre and his teammate, Jeremy Van Horebeek who placed 3rd here last year, both had solid showings to start the season not only by battling up front but also by giving the Factory Yamaha 2 top 5 finishes. Joining the list of riders who call Valkenswaard a home GP is Red Bull KTM Factory Racing’s Glenn Coldenhoff. Coldenhoff is looking to bounce back from a troublesome weekend in Argentina where he fell hard in Saturday’s Qualifying and then struggled to place well Sunday. The 2015 MXGP World Champion, Team HRC’s Tim Gajser was forced to miss the first round with an off season injury but he is slated to return to action this weekend. Gajser will be the first MXGP rider to line up for Team HRC this year. TM Factory Racing’s Max Nagl could impress this Sunday after scoring a top ten in Patagonia with his new team. The German also was on the podium here in 2016. Jeremy Seewer, the newest addition to the Wilvo Yamaha MXGP Team, has already shown he has the speed to compete in the MXGP class after racing in the front of the field during his rookie race in Patagonia-Argentina. Second here in Valkenswaard last year the #91 was one of the strongest of MX2 competitors. MXGP Championship Top Ten: 1. Jeffrey Herlings (NED, KTM), 47 points; 2. Antonio Cairoli (ITA, KTM), 47 p.; 3. Clement Desalle (BEL, KAW), 40 p.; 4. Jeremy Van Horebeek (BEL, YAM), 34 p.; 5. Romain Febvre (FRA, YAM), 34 p.; 6. Gautier Paulin (FRA, HUS), 30 p.; 7. Shaun Simpson (GBR, YAM), 24 p.; 8. Julien Lieber (BEL, KAW), 22 p.; 9. Maximilian Nagl (GER, TM), 21 p.; 10. Glenn Coldenhoff (NED, KTM), 21 p.
Red Bull KTM Factory Racing’s Pauls Jonass is continuing 2018 where he left off in 2017 which as at the top of the standings. Jonass didn’t lead every lap in Argentina but perhaps more impressive was his ability to real in many consider to be his title contender this year, Honda 114 Motorsports’ Hunter Lawrence. All things considered though Lawrence was impressive in his own way last weekend, not only did he hint was he dealing with unknown personal issues but it was his first race on a new team and new bike. Lawrence took the first FOX Holeshot of the season and will likely be a contender for the win this weekend. Rockstar Energy Husqvarna Factory Racing’s Thomas Kjer Olsen rode to an impressive 2nd overall to start the season and now that he is no longer a rookie he has matured. Last year we saw an inconsistent version of the #19 but this weekend will give us the first hint on if he can have two strong finishes back to back. Kemea Yamaha Official MX2 Team’s Ben Watson surprised many in Argentina as he battled for the spot on the overall podium before coming up just one point shy. Another surprise was Watson’s teammate, Vsevelod Brylakov, who jumped right back into the top ten in his first race back after being injured at the Valkenswaard circuit last year. LRT KTM’s Davy Pootjes will be one to watch this weekend as well. For Pootjes this is his home GP where he will look to replicate the Fox Holeshot of the last round and fight for the podium. Other riders to mention include Bike IT DRT Kawasaki’s Darian Sanayei and Team HRC’s Calvin Vlaanderen who both saw bad luck in one of the two opening races, a bike issue for Sanayei and a start crash for Vlaanderen. However both showed resilience with strong finishes to pair with their lack of luck. Hunter Lawrence isn’t the only privateer to watch this weekend though as Brent Van doninck had a break out ride here last year with a 3rd overall. The Husqvarna 8biano Motorsport rider from Belgium is no stranger to the sand and more than capable of a top five if not another podium this year. MX2 Championship Top Ten: 1. Pauls Jonass (LAT, KTM), 50 points; 2. Thomas Kjer Olsen (DEN, HUS), 42 p.; 3. Hunter Lawrence (AUS, HON), 37 p.; 4. Ben Watson (GBR, YAM), 36 p.; 5. Jed Beaton (AUS, KAW), 27 p.; 6. Vsevolod Brylyakov (RUS, YAM), 24 p.; 7. Henry Jacobi (GER, HUS), 21 p.; 8. Darian Sanayei (USA, KAW), 20 p.; 9. Jago Geerts (BEL, YAM), 20 p.; 10. Calvin Vlaanderen (RSA, HON), 19 p.
Saturday: EMX300 Free/Time practice 09:00; EMX125 Group 1 Free/Time Practice 09:45; EMX125 Group 2 Free/Time Practice 10:30; MX2 Free Practice 11:30; MXGP Free Practice 12:00; EMX125 Last Chance Qualifying Race 13:00; MX2 Time Practice 14:00; MXGP Time Practice 14:40; EMX300 Race 1 15:25; MX2 Qualifying Race 16:25; MXGP Qualifying Race 17:10; EMX125 Race 1 17:55. Sunday: EMX300 Race 2 09:45; MX2 Warm up 10:25; MXGP Warm up 10:45; EMX125 Race 2 11:30; MX2 Race 1 13:15; MXGP Race 1 14:15; MX2 Race 2 16:10; MXGP Race 2 17:10.